Another entry into the game-improvement fairway wood category is TaylorMade's V Steel 3-wood. This fairway wood features a unique "V-shaped" sole, designed to minimize resistance and allowing the clubhead to glide through/along the turf -- in any number of conditions -- and remain square through impact. If you can do all of that, of course, the result is longer, straighter shots. TaylorMade has a strong history of producing well-built, playable fairway woods, and the V Steel 3-wood lives up to the reputation. Fitted with a lightweight steel (TT Dynamic Gold) or graphite shaft (proprietary M.A.S.2 TaylorMade), they are available in both Right and Left hand orientations. The lightweight shaft options equate to increased swing speeds for maximum distance. Some will find the graphite shaft options below Stiff flex a little on the "whippy" side and, while the overall distance is good, the shot dispersion is less than ideal. A properly fitted flex in the steel shaft option might be a better fit for many players. The V Steel 3-wood is designed to provide a medium-height trajectory -- a good ball flight that combines for both distance and workability. 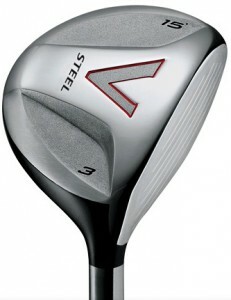 The V Steel 3-wood has a black top-side and brushed satin chrome underneath. Markings are simple with an enlarged "V" that mirrors the V-sole design. The steel face is made of high-strength 455 stainless, which has been engineered with a high COR (Co-Efficient of Restitution) for maximum distance. For those unfamiliar with COR, it is a measure of the energy lost (or retained, depending on how you look at it) as the ball and clubhead come together. When a static object (the ball) is contacted by the club head, some of the stored energy in the ball is lost at impact. The higher the COR, the less energy lost -- and the farther the ball travels. A unique hosel cartridge allows TaylorMade to precisely position the high-density polymeric material used to tune the V Steel's swing weight to D-2. There are other options in high-quality 3-woods of course, such as the Titleist 909F3 or Callaway FT iZ.